How Do I Create Data Visualizations? Data visualization is an emergent interdisciplinary field that approaches the portrayal, analysis, and communication of abstract information graphically. The onslaught of data has created a paradigm shift in how we interact with data. Intersections of Visualization: Below is a running list of categories that all fall under the shadow of Data Visualization. Data visualizations created with some data to tell a story. These are usually published online for public use. 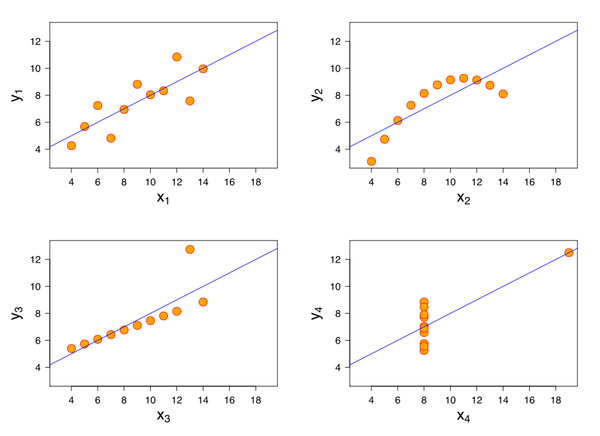 Anscombe's Quartet is a series of 4 tables that appear statistically similar however once graphed the differences between these four tables becomes obvious. Data Visualization can be used to find new insights in your research data.